Pasteleria Martínez, originally uploaded by jhoolko. It’s cold and rainy here in San Francisco, and whenever the temperature drops, I’m inevitably reminded of the winter I spent in Spain, the coldest winter the country had seen for many many years, and the coldest winter I had ever seen (yeah, yeah, So Cal wimp, I know). 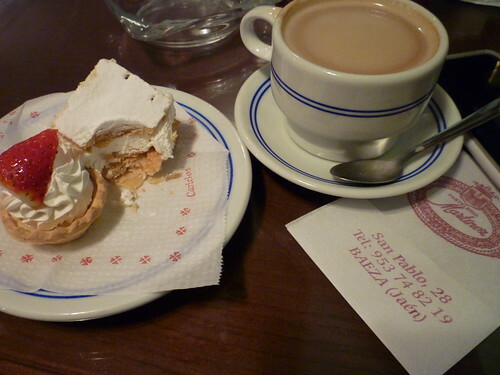 On a day like today, if I were in Baeza, I’d be settled comfortably into one of the cozy window tables at Pasteleria Martínez on the little town’s main drag, c/ San Pablo, watching the rain fall and listening to church bells. And stuffing my face with tocinillo de cielo.